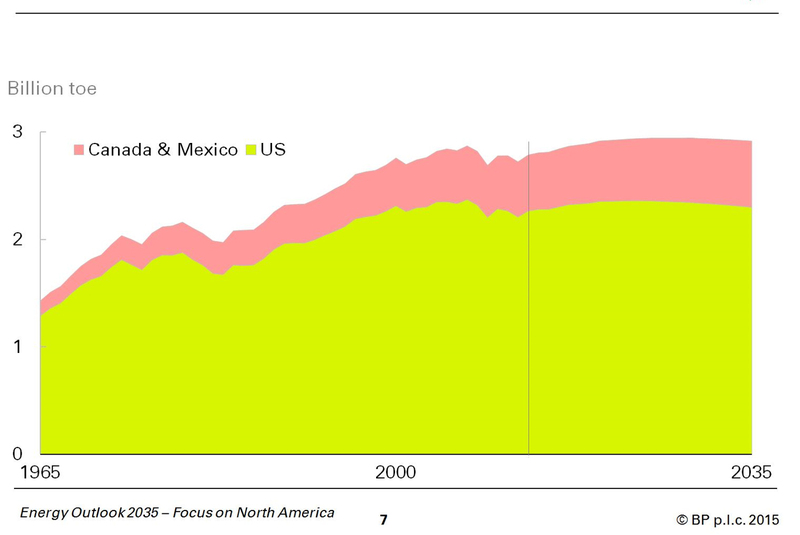 By 2035 the population of North America is calculated to increase by 85 million people. It is this increase and the increased income per person that is the driving force behind the growth in demand for energy. At the same time it is noted that the USA has been relegated to 2nd place among the world’s economies. 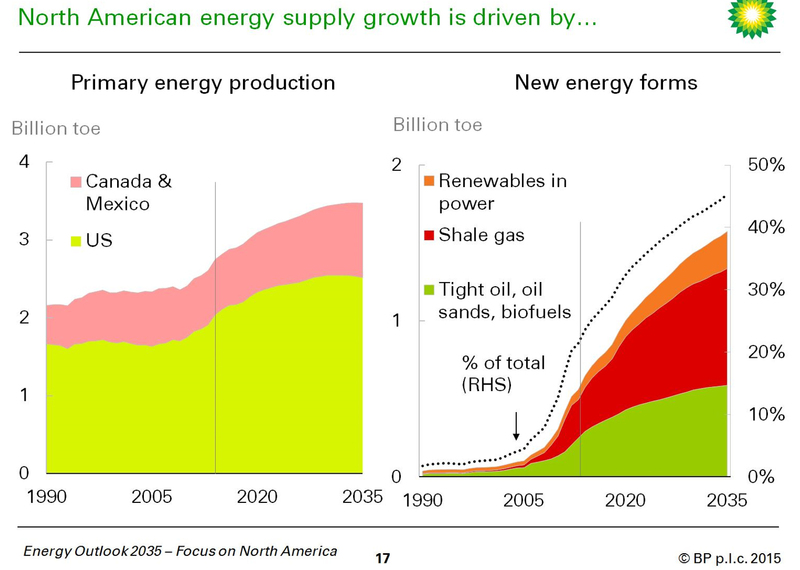 Meanwhile, the estimated growth in energy supply is rather modest (see the figure) and that means that BP is expecting that the future’s strong economic growth will occur without significantly increased energy use. 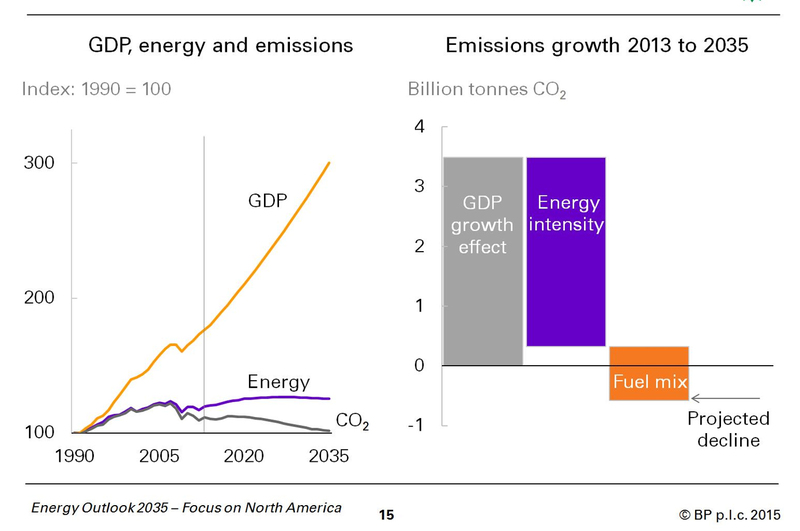 Historically economic growth has required greater growth in energy use. For economic growth to occur with no increase in total energy use requires increased energy efficiency and in terms of transport vehicles we have already seen a clear improvement. It will be exciting to watch this development. Here you can see the expected fantastic growth, reduction of CO2 emissions and nearly constant energy supply. 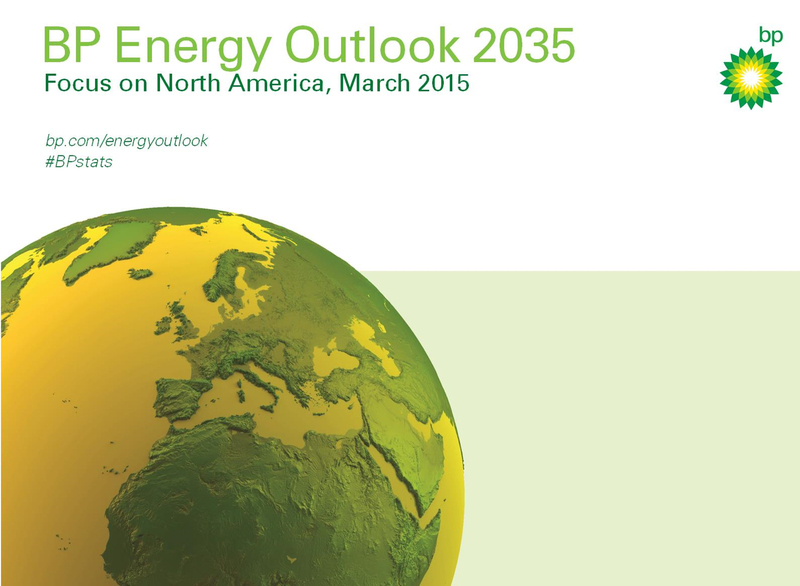 In terms of the fuel mix BP predicts a radical change in coal use. Despite that the USA has the world’s largest reserves of coal, BP believes that coal use will decrease to half of that of 2010. This decrease will be compensated for by increased use of natural gas and renewable energy, while oil consumption will be fairly steady. The change shown will primarily affect electricity generation. 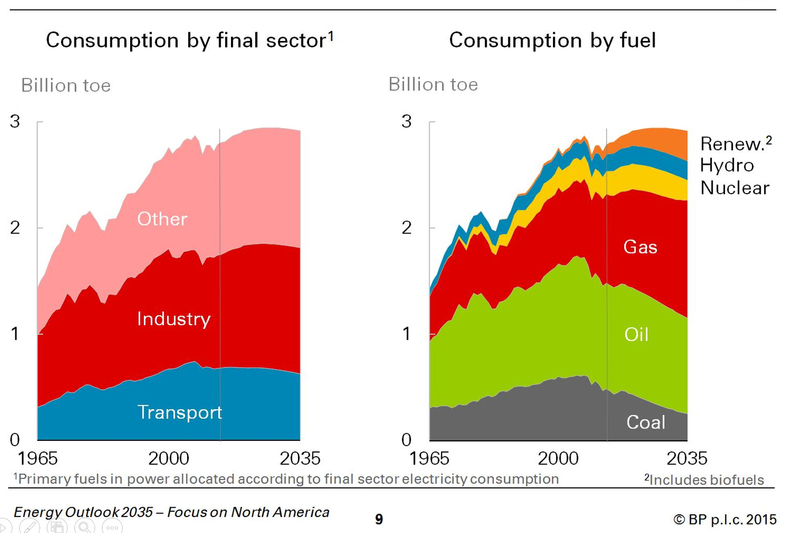 In the image above you can see that it is electricity generation that requires more natural gas and, in the USA, this is to be delivered by production of shale gas that is expected to double by 2035. It would have been appropriate for BP also to describe which shale gas fields in the USA are to supply this gas. The best known, existing fields have already reached maximal production. An increase of renewable energy to supply a few percent of the USA’s energy is predicted to occur but the rest of the change can be described with just one word, “FRACKING”. At the moment the fracking industry is experiencing its most rapid decline in active drilling rigs ever seen. They will soon be down to half the number of rigs that were active in November 2014. When we see that BP imagines that fracking-led production will double by 2035 then this will require twice as many active rigs as were drilling in November 2014. 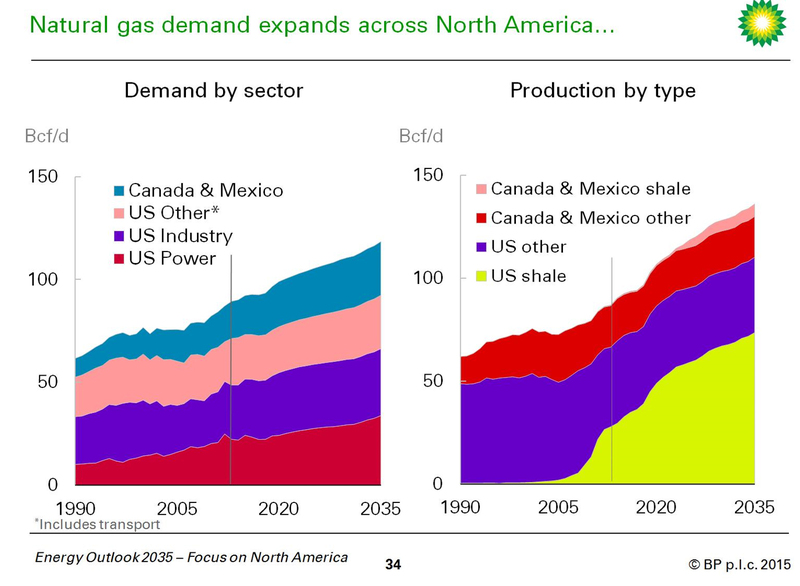 It is fracking that will also make North American a net hydrocarbon exporter. In 20 years I will be quite old but I hope to still be around. I am completely certain that the scenarios that BP is now presenting will differ markedly from reality. oil, water & food are triumvirate concerns, California is a harbinger of world food concerns, very real problem with another drought year bringing reservoirs to unusable levels. If BP means bogus planning then they can say just about whatever their shareholders want to hear! Oil companies with substantial cash flow would be wise to invest in essentials of life related engineering projects, not just continue pasting up the smiley faces. California is a good example of a breadbasket region, important in the world’s inventory of food supply. Let’s think about ongoing California drought in context of a nuclear confrontation in the Middle east, rendering food supplies from that region much diminished along with the California decline… Large cash flow from energy should be among sources of capital to construct water resource engineering features! BP insiders know full well how shaky the situation is in the Mid East oil patch. Keeping the fingers crossed and upbeat narrative do not hide radical/fundamental Islam on the move on every continent. Not only does oil flow become constrained, savvy strategic planners know of likely impacts to transport & utilities in western countries. The Muslim people will react to coming events in the Middle East; many acting out their sentiments against EU & North American infrastructure. Islam does not hold constitutions and western notions of open society government in high regard…. To maintain necessities of life becomes an existential requirement for Europe and North America. Bread basket regions in America will directly benefit from commencement of engineering features seen in the “North American Water And Power Alliance” compendium. Strategic authorities warn of high altitude nuclear detonation affecting solid state infrastructure controls on a continental scale. Old car collectors will ride, most cars built after 1985 will stop on the spot when EMP/HAMP occurs. Trucking grinds to a halt.The electric grid is vulnerable. North Korea and Iran collaborate on these things. Container ships substitute for nuclear submarines when it comes to launching missiles into the troposphere. Water from NAWAPA will recharge North American aquifers. BP can help with projects to bring water from Canada and Columbia River outflow. And, the railroads are most durable mode and must be enhanced in capacity & reach to keep food moving while the trucks are slowly put back to work, with new electronics. The big oil companies have enjoyed 100 years of Middle East & SE Asian Muslim oil bounty. Now they have ability to assist capitalization of water and food and transport to help maintain civilization! BP reminds Art Berman’s remark about Exxon’s Rex Tillerson: that the company is in liquidation and that the management fears the shareholders will find out about it. Credit expansion is one component of economic ‘growth’ the other is energy inefficiency. More waste = more growth so the idea that the US or any other country can become more energy efficient and still maintain high levels of business expansion is a non-sequitur.